IDEALLEX SDN BHD established in 2004 with aim to be an most water filtration products outlet in Johor Bahru. Our place is located at 69, Jalan Bentara 20, Taman Ungku Tun Aminah, 81300 Skudai, Johor. 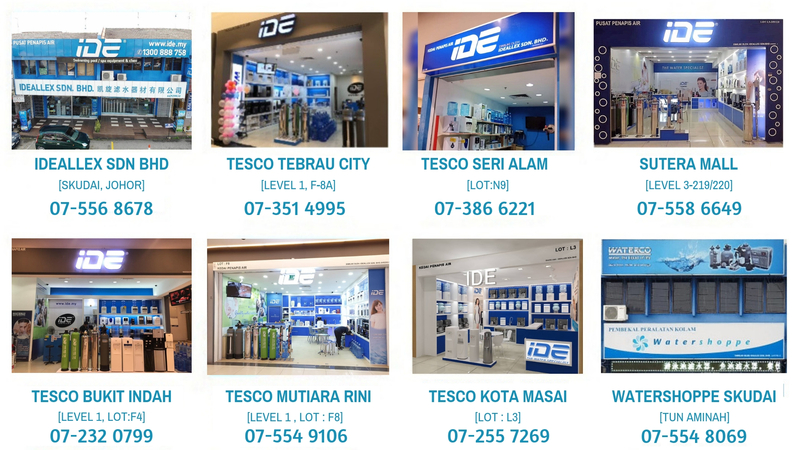 Well Known Brand name call I.D.E in Johor Bahru. To provide a better water filtration products & services for local markets need. We specialised in sales & service of various types of Home, Office, Industrial, Restaurant, Commercial Hot/Cold/Warm Water Dispenser, RO System, Water Filter & Spare Parts. Our Company also carry the branding filtration products from Australia, America, Korea & Taiwan like WATERCO , IDE Or 3M Foods & Beverages filtration system as Authorized Dealer in Southern Region Of Malaysia. We are also provide Sales or Rental in water dispenser/water cooler. We strive constantly to provide high quality products and services at competitive prices. We commit ourselves to constantly enhancing our accessibility, professionalism and depth of quality to create long-term, beneficial relationships. We also endeavor to build our reputation as an industry leader in people satisfaction, sales growth, products quality. The ultimate goal is to create better lifestyle through fulfilling the most fundamental of human needs, goods, clean and healthy water. We want to became most one stop water solution outlets IDE in Malaysia, not just in terms of market performance, but in our value as educations and innovations in the field. That's why we upload high standards of ethical conduct in everything we do, operating with honestly, integrity and trust while being fully accountable for all our customers.